"Duchess," said the admiral, "I know. We can put the left-over daffodil and crocus bulbs in circles around the tree in the front." "Right! why didn't I think of that. But will the hose reach?" "Yes." What, dear friends and readers, is happening here with phase 2? Or what was phase 2, anyway. Remind me. And what phase 3 which begins to sound serious? First, Phase 1 is still going on. You will recall (of course) Phase 1 was true upstairs/downstairs management. Yesterday I did finish the re-arrangement of our library downstairs, put in place the three folding ladder stools I had bought, 2 of the cheaper 2 step metal type that are just like the one I brought home from my mother's apartment. The third, more expensive, has 3 steps and is made of dark mahogany, prettier, but also takes me much higher and will not be in my room. My room is set up, including the choice of pictures on the walls. But I'm not done. Starting today and once a week I will go upstairs and for an hour get rid of old, obsolete, broken, sometimes engrimed, filthy stuff, put as much as will bit into 2 bins and wait until the next week to repeat. By Easter all of the attic will be clear, front and back except for the machines and larger kinds of things I have to wait for special collections to pick up. Among these a set of (hated) bamboo curtain-like things I used to cover windows when I first came to Virginia. The nosy neighbors were so shocked I didn't cover my windows they actually bothered me about it, complaining they could "see in." What, pray tell, do you see, I asked. Not the bedroom which they had fenced away anyway. Indeed they saw nothing distinct at all unless they were to come up to the window and really peer. What riled me was they were demanding I spend money I didn't have -- to fulfill their aesthetic of privacy. Parallel: employers, institutions, private and public, gov't programs which require that you do X but provide no money for it. So I bought these ridiculous (but dead cheap) bamboo curtain-things. They wouldn't go up and down; once it was lighter in that out you could "see in." But it seemed to fulfill this norm. Nowadays I have pretty shutters or curtains -- which cost. What nowadays gets me is I see neighbors build or renovate houses where a large swathe of the place is windows. Window doors, widows walls. And one can "see in." This is now showing off; this is having a house which ought to be on a cliff overlooking a bay or near or on mountains. Instead of staring at a hedge or hedges (sometimes very tall) which are placed all around the absurdity in order to provide a barrier from prying eyes, feet, minds. Or nothing. Across the street the people placed a huge room in front of the rest of their house and it appears to be an Everything Room, with bar, huge TV on the wall, some sort of tables, chairs galore and whatever else. I admit that I can't really see in as no one really could see in my house 30 years ago. It will be very satisfying when I pitch all these out of that attic. They are so big I must throw them down the ladder. Bang Bam Swosh. But I digress. Phase 2 is outside, gentle reader. Fixing the outside! I did tell you about that: Upstairs/downstairs takes an outward turn; Halloween.. You have forgotten. Not to worry. The election distracted us. Anyway: why should you remember what I do? It's I who want to remember. The hedge is gone. Instead we have a flat area of straw in front of our screened porch. I am supposed to believe grass is growing there. You will recall (instantly) that according to the admiral we have a problem. The front part of the house has two brick supports under one window, and like unhappy caryatids who have lost their vases, have nothing to hold up. I walked around the neighborhood and ascertained there are other similar supports on near-by houses. Some have big rectangular boxes somehow affixed in the which flowers are growing. Others are like ours; some have hedges or bushes hiding them. One other house is like ours: they are out there for all to see. It's probably no coincidence this is the house three houses down from ours, one like ours (unspoiled by major change), lived in by a young Spanish family, husband, wife, three children -- who were tenants for several years and now own the place. It never went on the market. This is precisely our case. We were tenants (from 1983) and bought the house (1987) and it never went on the market. We have not come up with a solution we like. But I did see that many many houses have boxes with their electric meters showing and lots of wires coming from them to poles near by. Again many are set up next to bushes or hedges -- not covered as meter men from electricity, water, and gas companies must be able to come by and read them. Do not, gentle reader, say I am not a social creature you see. I check to see how I'm doing. I just don't like to be nagged to spend money I don't have for something not necessary. So what have we done. We've planted daffodils and crocuses. Yes we did. It was hard work. We went to a nearby landscaping place and bought a large bag of daffodil bulbs, white, and two smallers of crocuses, violet and yellow-y. We made two or three semi-circles coming out from one of the flower beds of mulch -- the, one in front of my study window to the right of the house as you face it from the road (its first square). Then in a rim all around the crocuses. I have never planted anything at all before in this way. I had a blub-planter. Caroline had bought me a charming kit of trowels and scissors and what not. The admiral can no longer bend or put weight on his knees (arthritis) so he half leaned over and choose the spots, and himself sometimes tried to dig when my hands and arms gave out. He had wanted to buy a long-handled bulb planter but there was none in the shop. I dirtied a sweater to the point the dry-cleaner refused to take it. I have to try to wash it in woolite in the washing machine. It took a couple of hours one afternoon and one on another. It was satisfying to dig in the dirt, to reach the earth and pull up clay. 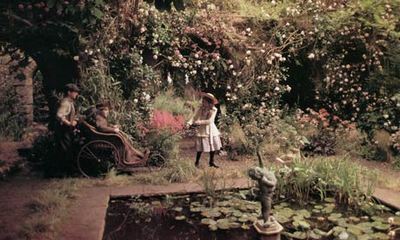 I fell like I was in The Secret Garden at last. Didn't Dickon talk about earth -- or other characters. Vita Sackville-West in her Georgic poems, The Land and The Garden. But we do now have the other flower bed along the wall which contains my wide window and one of Yvette's large windows, so it is between both and can be seen through both windows. The admiral would not hear of trying to plant that with daffodils and crocuses similarly. I don't know why. He came up with rationales, the most frequent of which is our hose doesn't reach. Caroline said there is no such thing as hose extensions, but I asked a neighbor and she said there was such a thing -- as did the Admiral (my final authority in all things as you know.) I said we can use a bucket. No. In spring we would return to said landscaping shop and see. I worry we will have nothing. Yvette likes to look at flowers; indeed she once tried to make a flower bed. I knew nothing about these things and had two jobs as an adjunct at the time and was trying to translate poetry and all sorts of things. The admiral was supposed to help her but he didn't and it all died. (This was about 19 years ago). He did put the bed in a bad place -- in the back where the soil is pebbly and hard and not far from the side of the house which is swampy in winter. I did not at the time realize it was in a bad place. I did a few months later and since then know where I can plant stuff in this land around my house and where not. But too late for Yvette's flower bed. Lest she not be renewed for her job, I want this flower bed to be flourishing this spring. (He reads this, gentle reader). We do have some left-over bulbs and it is these the Admiral referred to when he came up with a plan for them. In the center of our front lawn is a small tree planted by Rob's mother (Rob is Caroline's partner). It's doing fine. Little, maple-like (maybe it's a maple). but coming along. I have seen the Admiral weed the circle of mulch and dirt around it. Reddened the earst, and fields were wet and grey? With rough words and kind hands? Held fast by earth, being to earth so near? But I am not getting to phase 3, and I have run on. Phase 3 is renovating the inside of this house. Yes. It is a long tale to tell of our two bathrooms, 63 years old now. Upon buying the house, I found a plumber who for $300 stopped the cast iron tub from flooding the hall right next to it at long last. Not soon enough to stop the little wooden squares from having gotten unstuck, but still after that for 25 years no floods. We have two bathrooms joined by a wall; on one side a small bathroom with a shower and toilet and sink (no tub) which looks out on our bedroom. Alas, the shower probably leaks. Not a lot, but enough to make the long wall in the big bathroom impossible to keep painted. I've painted it three times, once before the lawyer came to evaluate the house for a mortgage. Each time the paint eventually peels. I replaced the toilets once. I was jipped and got inferior ones. The originals were much better. The sinks are not happy and require Drain-O weekly. One I got a contractor who said he would fix the big bathroom and about a quarter of the way in just stopped coming. He left it a mess. It was then I had to give up on the medicine cabinets and about a kind of table-bench to keep stuff on in the big bathroom -- which faces our long hall, the one with the ladder that comes down from the ceiling. And so it goes. We went to Bath-Express aka The Kitchen Guild. A woman came out and told us she was our designer, the program manager. It was like talking to a Santa Claus. It seemed so easy to sit there and just chose all these lovely modern working things, from toilets to showers, to tubs. to cabinets. Now what kind of tile do you want here? Three different boards each with different kinds of tiles. What kinds of faucets? Light fixtures. All sorts of types and made of different materials and colors and you can mix and match. Do you want the floor tile to face you as triangle or squares. "Squares" I said as that's more peaceful. At first I was fool enough to think she was admiring my taste. Of course she was flattering me. In the background a radio playing soothing NPR classic music. Last time we went to a shop and it was nothing like this. No such choices but after we produced our diagram and explained the man said $32,000. We walked out. Or maybe we phoned and then hung up. I admit the cost is not much less this time. Last time was more than 10 years ago, probably before the Admiral retired. But we have done it. In our old or middle age we will have two pleasant rooms with things nice on the eyes that work. The showers and tub will have glass doors (no more plastic curtains to go wretched). We did put in a fan system last year and that will stay. We do have insulation (put in in 1993); that helps. The admiral did have to drive back to our house and return - took about 20 minutes. (The shop is in Old Towne and we live just outside). We needed to write that check on Schwab, He was pleased. He did think the quality of all the goods was sound -- good real woods, real granite, sound lights, solid fixtures. He said after all if we like what's done maybe we'll renovate our kitchen once again. We did try once, in 1993, but we were cheated partly, bought stupidly partly - the cabinets are white pressed wood -- yuk (and one doesn't even match). We have replaced the stove and fridge once since, but the room is now in not such good shape. I worry it will cost more as it contains our clothes washer and dryer (the oldest machine the house, there since 1960!). But it would be pleasant on the eyes -- I want dark colors for the cabinets, the ceilings are now peeling, the linoleum has had it. He seemed to agree that this would come after I enclose the porch so I said I'd like the outside of the house painted the lovely cream color the man who fixed my screen porch 4 years ago painted the brick wall. The porch had become the Admiral's garage for keeping stuff in. It had been between 1983 and 91 our dining room in summer but then we got the air-conditioner and just stopped using it as a room, and I knew it scandalized the neighbors. I used to think when someone would pass by and studiously look away that I would get myself some crates and sit on them on the sidewalk and read. But I never did. The house is not a blue I have been happy with ever since it was first painted in 1994. I wanted a soft light turquoise-greeny-blue like one house has in the neighborhood. But the contractor said that would cost too much and seemed to pressure me into this blue, "just as nice" he said. So much trouble to mix paints, he said. Well, it wasn't and it isn't. It was originally bright -- light blue -- but bright and Caroline teased me about it. It had cost so much. Was it $5000 as part of painting the house inside too? (Remember gentle reader I hate writing checks, I hate spending money. I have not changed one iota while I am writing all this, but I do know I have it to spend even if I hate spending it. (It's scary. I worry maybe I should hold onto it because I or Yvette or the admiral might need it someday -- for such like reasons my parents held onto it.) So I lived with the blue and gradually it faded. And people if they ever visited could find it with ease. The only light blue house in the area. Anyway it would soothe my heart to get rid of that color, to me an eyesore or proof of my incapacity to cope with contractors. Did I ever tell you about the contractor that stole my axe? "No?" Another time. Today we are going to plant the left-over daffodils and crocuses and if I've the energy I'll throw out stuff for half an hour. So all phases happen together - because we are all one piece as Mr Roger says. Have I said all this makes the cats unhappy. They much prefer me sitting and reading and writing. I unnerve them with my new behavior. Planting bulbs can be so difficult. I found a lovely attachment for my electric drill; it looks like a large corkscrew, about a foot long, with marks at different points which are for different kinds of bulbs. Who knew different kinds of bulbs need to be planted at different depths? Anyway, I can simply take my electric drill with the attachment, connect an extension cord suitable for outside use, and drill the holes in whatever pattern I wish. I put a spoon of bulb food at the bottom of each hole, put in the bulb, then replace the dirt that came out with the drill. Many bulbs multiply, so I now have many grape hyacinths and daffodils (who called them daffydowndillies?). Tulips and hyacinths I plant every year because it is too cold here in Ohio and they die. I like them so I replant them. Some bulbs are rather expensive, so those I put a few more in each year. As we go on, maybe we'll get better equipment. Right now all we have is the small kit Caroline (Laura) bought me. I probably didn't get all the bulbs in properly. The admiral weeded. Don't flowers have lovely names? the putting together of all the syllables reminds me of Italian.